One of just under 100 photos taken today on a walk into and around sunny York. 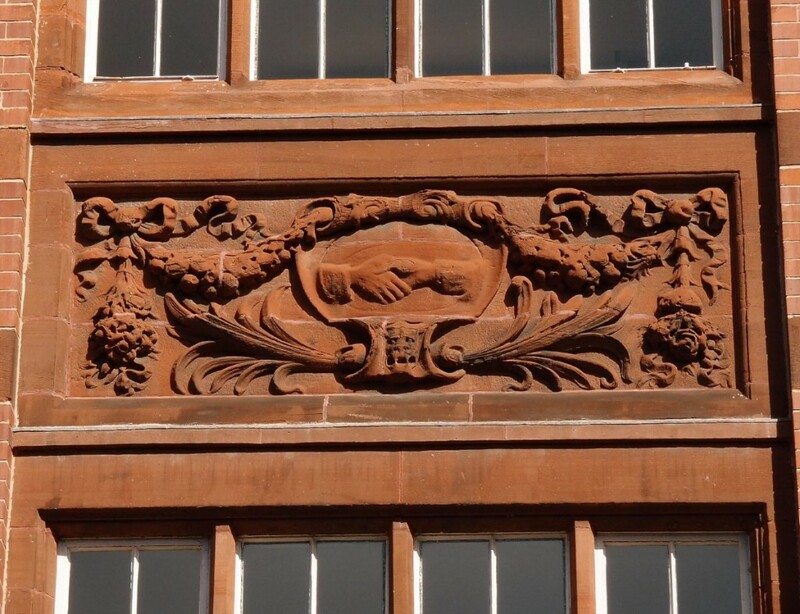 There were other possibilities but I thought I’d choose this one, of a detail on a substantial building on George Hudson Street (or Railway Street, as it was called for some time). I’ve taken photos of this before, but on gloomy days when the light was poor, and I don’t think I’ve ever mentioned before how much I like it. Or how difficult it is to get reliable and detailed information on the building, which is another reason I’ve not mentioned it before. We’re looking at what some of us might remember as council offices, what others will remember as the Co-op building, but before any of us remember it it was built for the York Equitable Industrial Society, and opened in 1899. Above the existing ground floor retail units it’s in the process of being converted to student accommodation, and its Tanner Row end is covered in scaffolding. The external appearance should remain the same, including this handsome and rather touching detail of a shaking of hands, a reminder of the Co-operative movement at a time of growth and strength. There is an extensive article on the opening in the 6th May 1899 edition of the Yorkshire Herald. Red Nostell brick with sandstone dressings, Architects Athron and Beck of Doncaster. I visited this building of “many Staircases”,mid 1946 on,for 5/6 years,in two roles.First as an Apprentice Instrument Maker at Cooke Troughton And Simms on Haxby Rd,and after induction into theAmalgamated Engineering Union(Mandatory for Apprentices),and the union meetings(held on the top floor),for payment of dues,on a fortnightly basis,and showing willing to influential shop stewards!The other role was to attend the dance hall ,with partner ,as a cheap,but friendly venue alternative to the expensive De Grey Rooms,complete with live dance band and all!All gone now,OH! DEAR!